For dogs and other pets, ibuprofen has a narrow safety margin that could induce toxicosis (health problems due to poisoning). In fact, a review of ASPCA Animal Poison Control Center calls found that the most common medication causing dog poisoning was ibuprofen. Coated ibuprofen tablets taste particularly sweet to dogs, which encourages them to eat as many ibuprofen tablets as they can. In addition, calls to the ASPCA APCC also included owners giving their dogs ibuprofen because they thought it was safer than giving them aspirin. Why is Ibuprofen Harmful to Dogs? Ibuprofen is classified as an NSAID, a nonsteroidal anti-inflammatory drug that relieves inflammation, fever, and pain by preventing enzymes (Cox-1 and Cox-2) from producing prostaglandins partially responsible for pain. Prostaglandins are special hormones created at injured or inflamed sites in the body to help facilitate healing. By inhibiting production of prostaglandins, ibuprofen interferes with the protective stomach coating provided by prostaglandins. In addition, Cox-1 enzymes support activation of platelets necessary for blood clotting. Consequences of reducing effectiveness of the stomach lining in dogs include diarrhea, vomiting, and formation of gastric ulcers. Decreased platelet activity may increase the risk of abnormal, internal bleeding. In addition, Cox-1 and Cox-2 enzymes could reduce blood flow to the kidneys and precipitate kidney disease or kidney failure in dogs. When dog owners know within minutes that their dog has consumed multiple ibuprofen tablets and can get them to the veterinarian’s office in less than 15 minutes, the vet may perform a gastric lavage (pumping of the stomach) on the dog. Gastric lavage procedures remove toxins from the stomach before the dog’s body can absorb the toxin. If a dog begins exhibiting ibuprofen overdose symptoms, veterinarians will administer activated charcoal every six hours for 24 hours since ibuprofen and other NSAIDs undergo recirculation within the kidneys. Never give dogs suffering ibuprofen toxicosis over the counter agents containing bismuth sub-salicylates (Pepto-Bismol, for example) to relieve gastrointestinal issues. 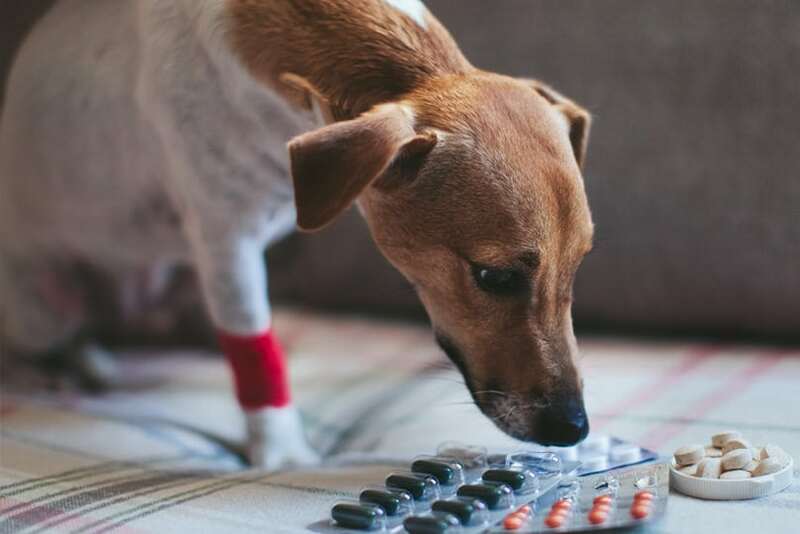 Adverse interactions between ibuprofen and salicylates can make the dog more ill. To reduce stomach acid, vets may prescribe dogs proton-pump inhibitors or H2 blockers for one to two weeks. Dogs suffering tremors or seizures after ingestion of ibuprofen are sedated with barbituates or diazepam on an as-needed basis. What Can You Safely Give a Dog for Pain or Fever? 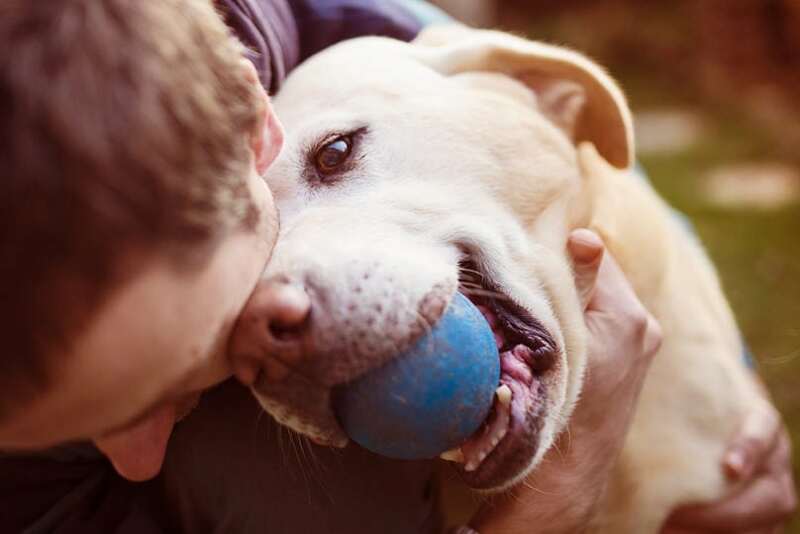 An analgesic that acts on opioid, serotonin and adrenergic receptors in humans, Tramadol has been shown to reduce pain in osteoarthritic dogs in placebo-controlled studies. Researchers think Tramadol’s effect in dogs is promoted by uptake of norepinephrine and serotonin in the brain rather than opioid effects. Side effects of Tramadol include sedation, excessive salivating and vomiting. Dogs with a history of known seizure activity should not take Tramadol, as the drug could cause seizures. In some cases, Tramadol may be administered simultaneously with an antidepressant to enhance serotonin uptake. Originally developed to control seizures in humans, Gabapentin is now prescribed for pain in dogs. By decreasing levels of neurotransmitters associated with pain sensation and perception, Gabapentin works to reduce many types of pain, especially when combined with another safe pain reliever for dogs such as Tramadol or Amantadine. Gabapentin is well tolerated by dogs but can cause marked sedation and unsteady movements. Veterinarians generally start with low doses of Gabapentin and increase the dosage as needed. Dogs diagnosed with advanced musculoskeletal conditions may experience more trouble walking or standing than dogs with mild to moderate joint and muscle disorders. Developed to combat viral diseases like influenza, Amantadine was later found to reduce chronic pain in dogs and people. Amantadine works by blocking receptors in the central nervous system associated with pain and sensation pathways. Like Gabapentin, Amantadine works better when taken with another analgesic that is safe for dogs. Currently, Amantadine is prescribed by veterinarians for canine arthritis, disk disease, bone cancer, and neurological pain. It is also be given to cats following declawing surgery to minimize discomfort. Side effects of Amantadine include flatulence, diarrhea, and restlessness. Amantadine should be used with caution in dogs diagnosed with kidney or liver dysfunction, seizures or heart disease. Although Rimadyl is an NSAID like ibuprofen that has been FDA-approved for relieving arthritis pain in dogs, it is formulated to work safely with a dog’s body chemistry and organ functioning. Available by prescription only, Rimadyl improves mobility in dogs with arthritis while reducing joint inflammation and pain. Backed by over 10 years of research, Rimadyl is the first anti-inflammatory canine medication specifically made for dogs. According to Rimadyl’s website, more than 20 million dogs have been prescribed Rimadyl for relief of arthritis and osteoarthritis symptoms. Never give dogs over the counter medications unless directed by a veterinarian. While we love to think of our dogs as being “almost human”, many human medications contain ingredients harmful to dogs.